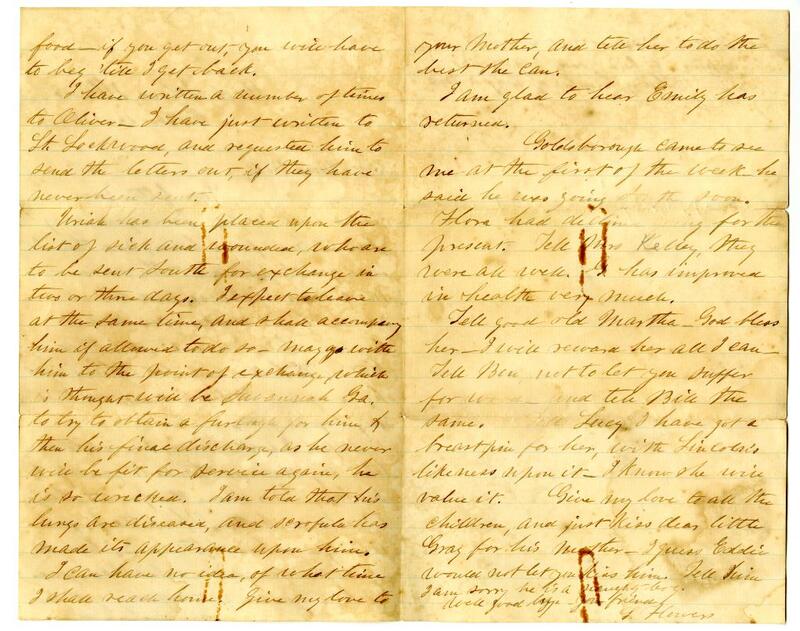 Item Description: A letter from Seraphina Brooks Flowers to Miss Bell regarding her trip to visit her sick son in prison. He was imprisoned in Rock Island, Illinois. She also discusses other family news, and her plans to travel back south. Item Citation: From Folder 1, in the Edmiston, Kelley and Flowers Family Papers #5230, Southern Historical Collection, The Wilson Library, University of North Carolina at Chapel Hill. Before I write more, I wish to return my sincere thanks to yourself & Dr. Fox. I am under the greatest obligations to you both. Thank the Dr. for me when you see him, & tell him please do all he can for you all, while I am gone. I hope you are not suffering yet for food. If you get out, you will have to beg ’till I get back. I have written a number of times to Oliver. 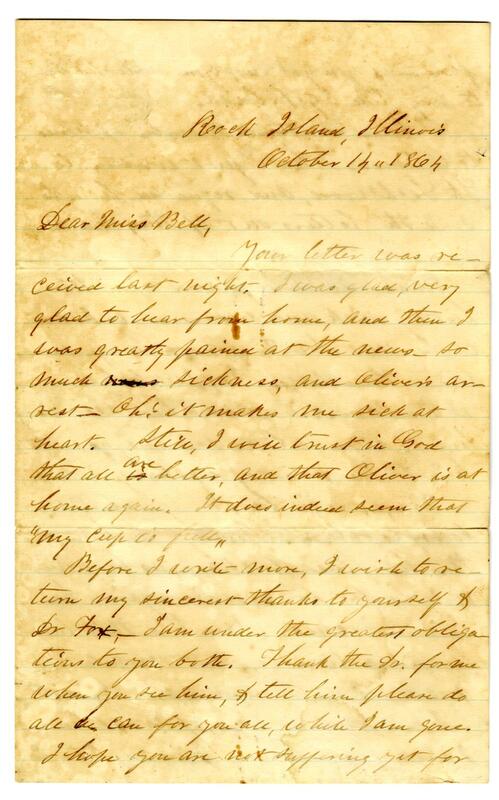 I have just written to Lt. Lockwood, and requested him to send the letters out, if they have never been sent. Uriah has been placed upon the list of sick and wounded, who are to be sent South for exchange in two or three days. I expect to leave at the same time, and shall accompany him if allowed to do so. May go with him to the point of exchange which is thought will be Savannah, Ga. to try to obtain a furlough for him & then his final discharge, as he never will be fit for service again, he is so wrecked. I am told that his lungs are diseased, and scrofula has made its appearance upon him. I can have no idea, of what time I shall reach him. Give my love to your Mother, and tell her to do the best she can. I am glad to hear Emily has returned. Goldsborough came to see me at the first of the week he said he was going south soon. Flora had declined going for the present. Tell Mrs. Kelley, they are doing well. G. has improved in health very much. Tell Eddie he must not eat the Chinkapins [sic. ], to be a good boy, and I will try to bring him and Gray a pair of boots. 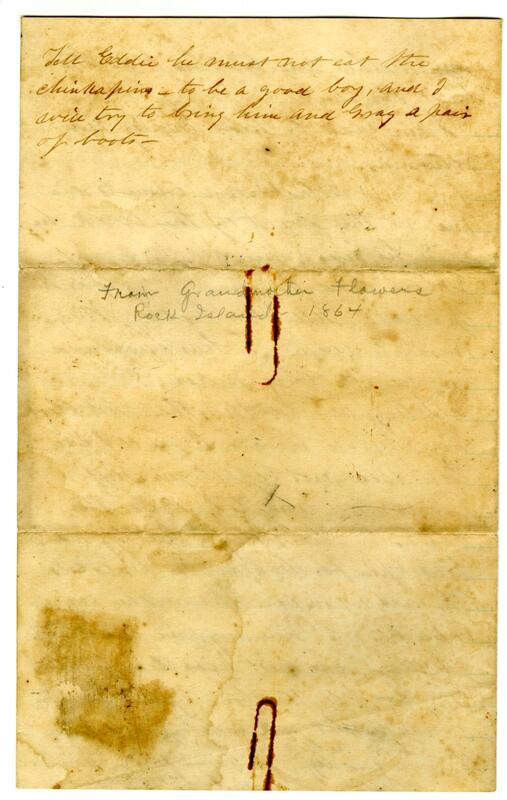 This entry was posted in Southern Historical Collection and tagged arrest, Civil War, Confederate Army, illness, prison, Rock Island, scrofula, Seraphina Flowers, sick. Bookmark the permalink.